Our next release, Vuo 2.0, will be our biggest yet. 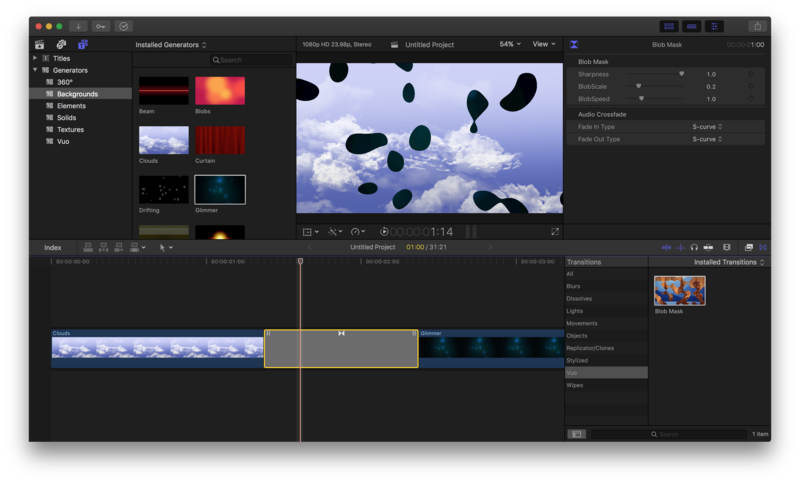 If you're a video editor or visualist, Vuo Pro 2.0 has special new features for you: the ability to create plugins for Final Cut Pro X and for VJ apps like Resolume. For everyone, you'll be able to bring your ideas to life faster and easier than before, with more flexibility in creating GPU-accelerated graphics, easier-to-use subcompositions, and hundreds of other improvements. We want more people to be able to use Vuo, and we want to make sure Vuo has a reliable source of funding so it can continue to grow for years to come. So with Vuo 2.0, we're changing Vuo's pricing. We'll be replacing Vuo's standard edition (free trial and $49) with Vuo Community Edition (CE). Vuo CE will be free for personal use and small organizations, fully open source, and have almost all of the functionality of the current $49 version (plus new 2.0 features). We'll be raising the price of Vuo Pro from $149 to $299. If you've already bought Vuo Pro 1.2.x, the upgrade to Vuo Pro 2.0 is free. Playfulness, craftsmanship, innovation — whatever your goals in creating live interactive media, we're committed to making Vuo support your work. Thank you for helping make it happen. Since 2013, you, the Vuo community, have suggested 453 features and voted for the ones that you wanted most. We implemented 44 of them in early beta versions through Vuo 1.2.8. Another 21 features requested by the community are coming in Vuo 2.0. We originally planned to call this release Vuo 1.3, but considering the magnitude of improvements, we realized that a better name would be Vuo 2.0. There are a lot of great plugin packs out there for Final Cut Pro X, but what if you need something totally custom? Vuo Pro 2.0 makes it easy to build video effects, transitions, and generators that exactly suit your needs. 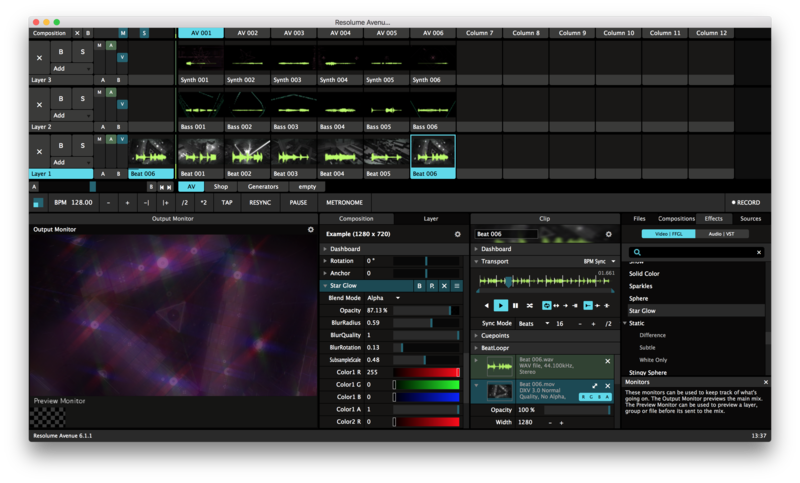 You can customize many VJ apps, including Resolume, Magic Music Visuals, and VDMX, with FFGL (FreeFrame 1.5) plugins. In Vuo Pro 2.0, with a simple menu option you can turn a composition into an FFGL source or effect. Here's a star glow effect created from a composition by Joe. 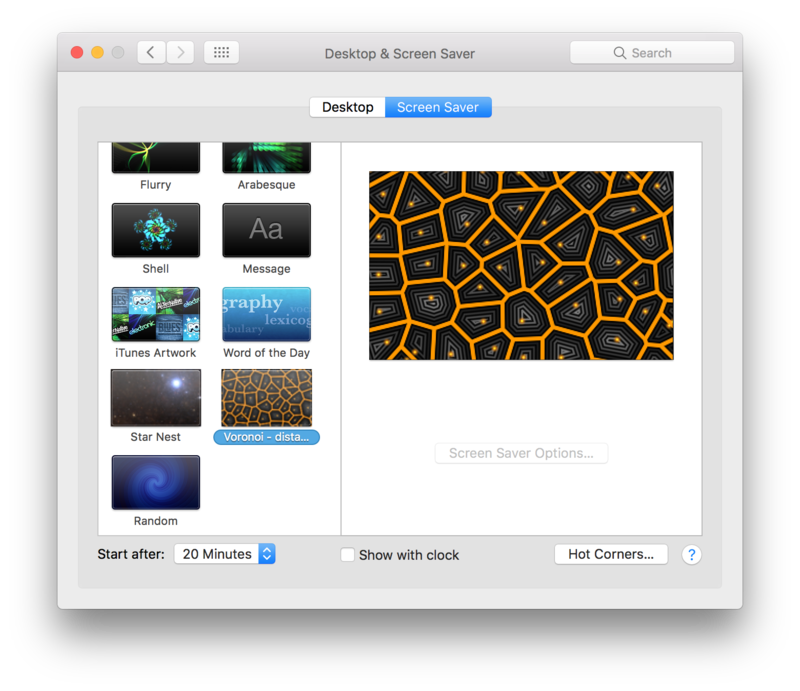 Screensavers aren't just for preventing burn-in — they can provide information, advertise products, and make your coworkers say "cool!" With Vuo Pro 2.0 you can turn compositions into screensavers, like this Voronoi pattern adapted from Shadertoy graphics by Inigo Quilez. Vuo 2.0 is a leap forward for power users and graphics buffs. 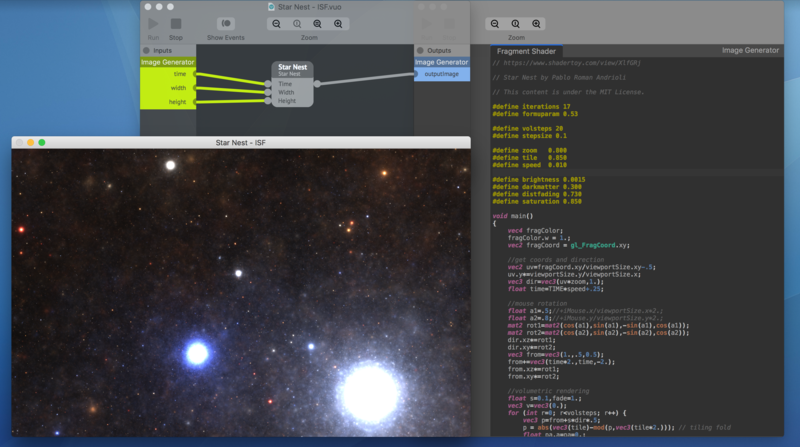 With the new GLSL editor, you can turn shader code into nodes — and edit it live, while your composition is running. 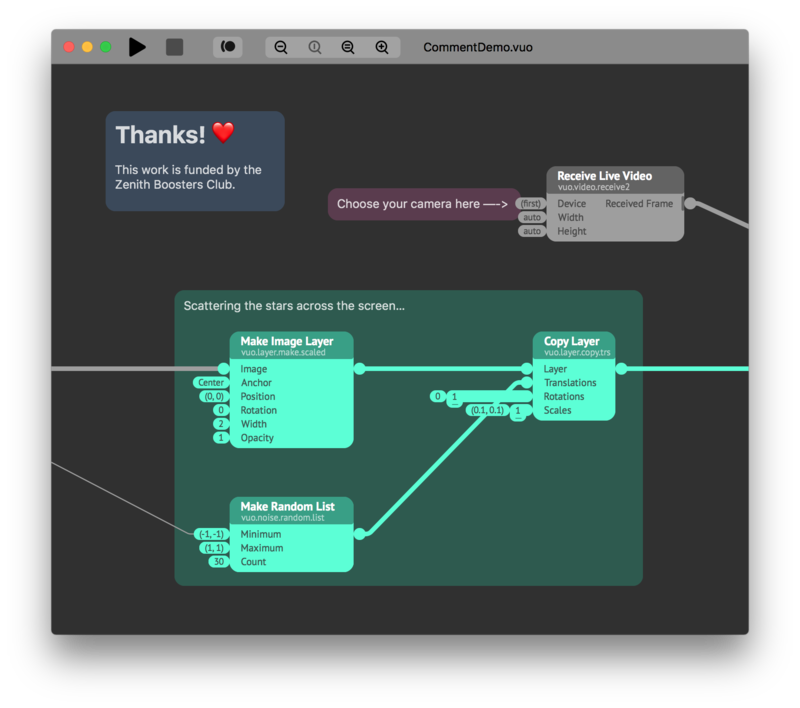 In Vuo 2.0, you can write notes and visually group nodes using comments. We agree with Alastair's remark on the feature request: "This will make coding so much better, especially sharing code between Vuo users and for training comps." You may have noticed in the screenshots above that we're updating Vuo's visual design. We thank the many designers in the community who've made suggestions over the years. Most recently, Bodysoulspirit shared some mockups that led to a fruitful discussion amongst the community and inspired our redesign of nodes and cables in Vuo 2.0. We hope these changes make Vuo simpler and more comfortable to use. That was just a taste of what's coming in Vuo 2.0. We'll share more in upcoming posts. If you're already working with Vuo regularly, we believe these changes will make Vuo useful for a wider range of projects and will make the process smoother and more enjoyable. If you haven't used Vuo for a while, we hope you'll give Vuo 2.0 a try. You might be surprised by how much Vuo has grown. Vuo 2.0 will support macOS versions 10.10 through 10.14. Over the past 5 years, 931 people and organizations have bought Vuo. Thank you! We appreciate all that our community has done to support Vuo. We believe in Vuo's potential to transform the way people create interactive media — which is why, for every dollar the Vuo Community has contributed to Vuo's development, our company (Kosada) has contributed 7 dollars. As we move forward with Vuo 2.0 and beyond, we want to ensure Vuo has a sustainable source of funding and, at the same time, to make Vuo accessible to a broader range of people. That's why we're making Vuo CE free for personal use and small organizations and raising the price of Vuo Pro to $299. Vuo CE is for people who aren't (yet) making a lot of money from creating media. If you're a student, maker, or part-time freelancer, this may be the right tool for you. Vuo CE is not just a free trial. It has almost all of the functionality of the current $49 edition, with a few restrictions. Vuo CE has a dialog on startup asking you to help fund Vuo's development, a splash screen in exported apps, and resolution restricted to 1280x1280 in exported movies. Vuo CE is free for personal use and small organizations. It's fully open source and comes with the Vuo SDK. Vuo Pro is a power tool for professionals. It includes advanced features for video editors, graphic designers, A/V technicians, lighting technicians, VJs, and dome media creators. And of course it has none of the restrictions of Vuo CE. Vuo Pro 2.0 is $299. If you've already bought Vuo Pro 1.2.x, you can upgrade to Vuo Pro 2.0 for free. Or if you have Vuo non-Pro 1.2.x, you can switch to Vuo Pro 2.0 for $100. We've kept the price to switch the same as before in appreciation of those of you who've already helped fund Vuo. Students and teachers using Vuo for personal use and schools that qualify as small organizations can use Vuo CE for free. If you're using Vuo in a larger institution or want to get the advanced features of Vuo Pro, you can take advantage of our 80% educational discount. That means you can get Vuo Pro 2.0 for only $59.80 — less than Vuo Pro costs now. When buying 3 or more copies of Vuo Pro, you can continue to take advantage of our bulk discount of 10-20%. You can also combine the bulk discount with the educational discount. Would you like early access to Vuo 2.0? We hope so, because we'd appreciate your help testing it. Anyone who's ever bought Vuo — even if they haven't upgraded to Vuo 1.2.x — will get access to the Vuo 2.0 beta for free. We estimate that we'll release the first beta version in 2–4 months. That could change depending on how many bugs come up in our internal testing, but we'll keep you posted. We'll share more about Vuo 2.0's new features in the coming weeks. Please tell your colleagues, friends, and favorite bloggers about Vuo 2.0 to help our community grow. Whouhouuu thrilled ! Can’t wait ! So happy also about the node redesign ! Can’t wait to play with them ! And can’t wait to test the new features. I will pay an amount for the upgrade even though I have 1.2 pro, huge release ! Such exciting news Vuo team! Such exciting news Vuo team! So looking forward to this release and the beta version coming up. Awesome!!! Great news & congrats for all the hard work! But, will the GPU Intel iris issue be solved? https://vuo.org/node/2209 I have read on your last post that you would be upgrading from OpenGL to Metal. Would that be implemented on this upgrade as it have been many months I am unable to use Vuo on my laptop. Thank you! kokot, thanks for the congrats and sorry for the bug. I'll follow up on the bug report. Congrats Team Vuo! Looking forward to the release. Muy interesante, estaré pendiente de poder probar vuo 2.0 Muchas gracias. This looks so cool! I would love to be a beta tester to try out the new fxPlug feature!! Chris, I discussed your suggestion with the team. While I totally understand not wanting to spend money on something that's going to be free soon, it would take us some time and possibly even a new release to unlock the trial version. We think it would be better to focus on getting the 2.0 beta release out instead. When the Vuo 2.0 beta is released, I think you'll be able to download and install it just like a regular Vuo version. We'll make another mailing list / blog post when it's ready. I hope you'll try it since we'd especially like to hear from people like you who have not used similar apps before. During beta testing, we mainly just want folks to use Vuo like they normally would and see if they run into any problems or anything confusing. Just upgraded my Vuo standard to Vuo Pro, looking forward to the 2.0 beta! What makes Vuo 2.0 more comfortable to use? We're changing the way we sell Vuo — plus an awesome limited-time discount for you and a friend! Vuo 1.2 is here! Now with subcompositions, beat detection, OSC output, USB HID, and plenty more.